Bookride: Stephen W. Meader. Bulldozer, 1951. Stephen W. Meader. Bulldozer, 1951. Stephen W. Meader. BULLDOZER. Harcourt Brace, NY, 1951. This is the third of a trio of Ebay nostalgia/ children's books (Young Adult) that are highly sought after. The other two, covered earlier by us were Jellybeans for Breakfast and Lazy Liza Lizard -- all much wanted by Boomers who grew up on them. The other two were for girls -this one is for boys and tomboys and budding business tycoons. 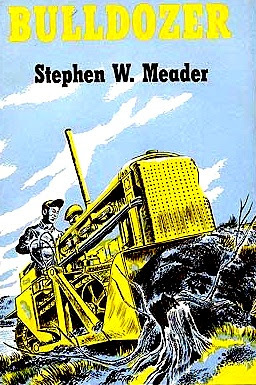 A fairly simple plot - Bill Crane and his friend Ducky Davis discover a Caterpillar Tractor sunk and abandoned in a lake and use their ingenuity to restore it and build a profitable business. Among their adventures, a successful battle against a forest fire. All with cool b/w illustrations by Edwin Schmidt. If the book was stabbed through the middle with a greasy kebab skewer and then dropped in a puddle it could hardly be worse but after all this we are assured '...pages are clean, no marks to text, no owner signatures, inscriptions, store stamps, remainder marks.' I would avoid buying the library of the collector who buys this. where can I purchase one ? Funny how things come back to you - this 'simple' book had me riveted in 1960 or so, as an 8 or 9 year old, and (other than a farming background) is no doubt responsible for my love of all things yellow, esp the tiny, wide gauge D2 featured in the book. I will have one before I pass!!! This book has been reissued by Southern Skies publishing, as well as several other Meader books, about $30 for a brand new copy! No book has had a more profound effect on my life than this one. Reading it as a teenager, it ignited an entrepreneurship and mechanical interest spark which have remained ever since, which I attribute to having gone into business for myself many years ago. It took years to find a copy prior to the advent of the internet, but once found, it became a cherished possession. It is still a thrill to read, evoking all those same sentiments it did years ago. I too vow to buy and restore a D2 before i go. I know where one sits at this moment. Highly recommended reading. meaderfannortherncal, we must be cut from the same cloth! I read 'Bulldozer' as a youngster in one sitting - it spoke so much more than the words on the page let on! Funny thing is, I didn't really grasp how much Meader's yarn resonated with me, how deeply the values it projected, until old enough to look back at the years past & truly reflect. And I've never been happier than rebounding from the dotcom bust, landing in the seat of a backhoe - and later pushing granite in a local quarry on a D6 on the graveyard shift. Those jobs didn't last long enough - I now renovate apartments & foreclosed houses. But I too will own and push dirt with a tiny little D2 before I breathe my last. READ BOOK AT LEAST A DOZ. TIMES IN GRADE SCHOOL. HAVE BEEN TRYING ALL LIBRARIES WITH NO LUCK. RAN ACROSS THIS SITE BY CHANCE. HOPE BOOK IS STILL AVAILABLE. PAPPI MAC (PS) WOULD LIKE TO READ AGAIN AT MY AGE OF 69. This fellow has republished Meader's work - way cheaper than finding an old copy! The bulldozer is one of the most popular equipment used for construction purposes. Bulldozers are used to cut and push large quantities of material without any trouble. Bulldozer for sale having wide range of bulldozers for sale. I got a copy of this book at a used book sale while fourth grade. My copy was a blue hardcover with a red trim and the title at the top...no picture on cover. Loved it, read it too many times to remember....just ordered a copy from ABA...Im now 57 years old and will read this book another 100 times...a great read! Celebrity Book Collectors. Part One. Dean Koontz's lost novel 'Hung' ?